Guide to quickly create new account in IRCTC website www.irctc.co.in for online ticket booking. Now you have to enter your personal details in the registration form. We have divided the personal details section into two parts because it is a little bit complex. The first part is simpler and the part two is a little difficult because it requires more attention. Let's understand these options one by one. It is a red star marked option, therefore, it is compulsory to enter in the registration form. Instead of a complete name, you should only enter your first name in this option. For example, Rajesh is named if your complete name is Rajesh Kumar Sharma. It is an optional option. If you have something in your middle name then you can enter it in this field. For example, Kumar is a middle name if your complete name is Rajesh Kumar Sharma. It is also an optional option. You can enter your last name or sir name in this option. For example, Sharma is the last name if your complete name is Rajesh Kumar Sharma. "Info! Please provide your exact name as per Aadhaar to avail Aadhaar based benefits on IRCTC eTicketing website." You can select your gender you belong. It is also a red star marked option, therefore, it is mandatory to fill it. You will not be allowed to type your date of birth but instead, you will be provided with a calendar after clicking on the option. In the calendar, you can select a date which is your correct date of birth. Select the sector in which your occupation belongs. It is also a compulsory option. And you have to select one out of following two given option. Select married if you are married otherwise select unmarried. Do you have any FAQ? 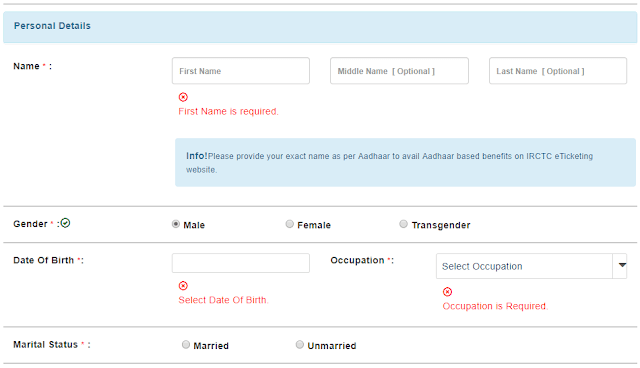 Do you notice the information provided regarding Aadhaar card in the registration form? Please share with us and our readers by writing it down in the comment box below.